As celebrations continue for The Simpsons' 20th anniversary, Fox is running a Simpsons scavenger hunt across its shows. Starting today, Monday 9th, and running until Friday 13th, the primetime shows on Fox will feature hidden Simpsons references and tributes. It could be a can of Duff beer, a Simpsons quote or even the cast and crew appearing! There are prizes daily, and a chance to win a big Simpsons prize pack, including a chance to attend a Simpsons table read! See the video below for more details, or go to the Fox site to enter after each show. Simpsons Season 20 to be released on DVD and Blu-Ray! Even though Season 12 was only put out recently, it appears Fox will be releasing Season 20 on DVD/Blu-Ray before the end of the year! Season 20 saw The Simpsons switch to widescreen and High Definition. Many other shows release their DVDs soon after the episodes have aired, so this decision release makes sense. It is believed that the older DVDs (Season 13-19) will continue to be released alternately with the latest Season, every 6 months. Airing this Sunday 11th October, The Great Wife Hope sees the men of Sppringfield become obsessed by Mixed Martial Arts. However, when Marge and the women protest about its extreme violence, the show's promoter challenges Marge to a match. British comedian Sacha Baron Cohen is to guest in an upcoming Simpsons episode where the family take a church-group trip to the Holy Land. Cohen is the alter ego of presenter Ali G and fashion reporter Bruno, but is probably best known for his portrayal of Kazakhstan reporter Borat (pictured). In the episode, Cohen will play an Israeli tour guide angered by the Simpsons, in particular Homer - who gets a case of Jerusalem Syndrome and believes that he is the messiah. The episode is slated for a March 28 airing, to coincide with Palm Sunday, and is titled The Greatest Story Ever D’ohed . The winners for the 2009 Creative Arts Emmys - the precursor to the main Emmy ceremony - have been announced. The Simpsons episode Gone, Maggie, Gone was nominated for Outstanding Animated Program, along with South Park's Margaritaville and episodes of American Dad and Robot Chicken. However, The Simpsons lost out to South Park - which is a shame, because theirs was one of the weaker episodes of the Season, while Gone, Maggie, Gone was on of the best of Season 20. The same episode was also nominated for Outstanding Music Composition For A Series, but lost to ABC show Legend Of The Seeker. There was some good news though, as Dan Castellaneta - the voice of Homer - won an Emmy for Outstanding Voice-Over Performance for the episode Father Knows Worst. Congratulations, Dan! 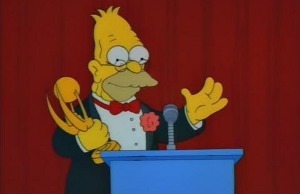 Also nominated in the same category were Hank Azaria - voice of Moe - for Eeny Teeny Maya, Moe and Harry Shearer - voice of Burns and Smithers - for The Burns and the Bees. 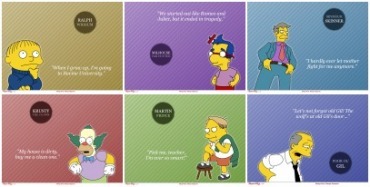 The Simpsons family have received a cultural makeover by an Angolan advertising agency to promote the show there. Even Homer's Duff Beer has been changed to Cuca, a popular beer in Angola. Homer, Marge and the kids were given brown skin instead of the usual yellow, and they wear traditional African clothes. Instead of her points, Lisa has braids. The show itself will of course air in yellow as normal - just think how long it would take them to reanimate it! Antonio Pascoa, the Creative Director of Executive Center, said, "Our goal was to adapt the satirical parody of the typical middle-class American family to Angola. If people don't like it than I guess they don't have a sense of humor big enough to enjoy the Simpsons." Promo Card for "Homer the Whopper"
The episode was written by Seth Rogen and Evan Goldberg. Comic Book Guy creates a superhero called "Everyman", which is turned into a feature film. Homer is cast as the lead, with Seth Rogen playing his personal trainer. The episode airs on September 27. Yet more wallpapers have been added to the gallery! Most of them come from yet another defunct site, Krustylu Studios and have been remastered so that we can bring you both our standard sizes (1024x768 and 1280x1024). Huge thanks to Brad for donating them! The one you can see top left was created by me and is from The Springfield Files. Wow, it's been way too long since I made a content update here, but this is a big one! Today we unveil our extensive guide to Simpsons censorship in the UK, listing all the words, lines and even whole scenes cut from episodes because of bad language, violence and some more reasons that don't make sense. I 'inherited' the guide from another site that shut down, The Britsons. And after a lot of work formatting, editing and adding to the great work done before me, we have what is one of our finest sections here at Simpson Crazy. If you're a Briton you will find it indispensible. If not, I'm sure you will have fun reading through what our TV channels believe is offensive! I also took a decision to limit the resolutions to 1024x768 and 1280x1024 because these are increasingly becoming the two most common resolutions. If you are using a low resolution you should consider switching up so that the backgrounds look better. An upcoming site Planet Springfield has decided to close before opening, and the owner, Kane, has kindly donated some of its content to us. We have 13 new wallpapers and 13 new images (ooh, unlucky) in the galleries. The pictures can be seen by clicking the "more" link below, and the wallpapers by clicking here. I was thinking the other day how long it's been since I added any pictures to Simpson Crazy. So I got out my creative cap and put together a new set of classy wallpapers, each featuring a character with classic quote. Each one is available in 1024x768 or 1280x960 res. It's just too much effort to make too many sizes. I finally got around to updating the Season 7 DVD guide with lots more details: includes special features, menu animations and more. I also updated the promo pictures page with a few new episodes. A guide for the Season Six DVD has been added at last. It lists special features, 'Easter Eggs', and all the cool menu animations! Season Seven has been partially completed, but as I do not have this DVD yet it is not finished. The Tracey Ullman shorts page has been finished finally! We now have en episode guide for all 48 shorts, where you can also download each episode. Finally, the contests have been reset. Thing is, I kinda messed up the last one (long story...). I've decided to scrap the character contest and concentrate of the Secret Sound contest, which I have more enthusiasm for. Head on over to the Interactive page to enter the new Secret Sound contest! Today we can finally unveil our bigger and better episode guide! we've got loads of information on your favourite episodes, from quotes to references to images. The main page has a few facts about the Seasons, with some opinion on how the show has changed. The Season guides have short descriptions of the episodes with a screenshot; then, clicking an episode name takes you to the detailed guide for that episode, which is pretty similar to our old episode guides, but with more info. There are a few nifty features too. If you're signed up as a member (click here for more info), you can submit quotes, references and visual gags to us and they will appear in the guide! Furthermore, several episodes have a 'Visual Summary' - this is a slideshow of screenshots from the episode, but soon will include a quote/fact for each image. Bart the Genius is the only episode to be completed so far, but more are on their way! Content, content, and more content! It's been a long while since we made a content update, but we've got loadsa great stuff for you today! First up, the song lyrics page has been totally revamped. The layout has been condensed so it is easier to see the songs - just click a song name to see the lyrics for that song. This will be merged with the music page (in downloads) over the next week or so, since both pages are very similar. More Ullman shorts have been added to our gallery: episodes 32 to 41 are up, and the remaining few will be up soon. The promo pictures page has been updated with images from Season 16's episodes. We now have over 220 images in this gallery! And finally, the Secret Sound and Which Character contests have been updated; The previous answers were Simpson Tide (Secret Sound) and Roger Meyers, Jr. (Which Character). Matt Starr and Fredrik Larsson still reign supreme at the top of the leaderboards, but others are not far behind! Whew, that's everything! And we've got some more great stuff lined up soon, so keep your eyes peeled! A seemingly small update, but it's taken me the last hour to mark the contests. The answers were: $pringfield (sound) and Captain McCallister (character). I have also made a page of the last six contest answers. New ones are now up, so go play!